Just months before leaving for my second deployment with the Army in 2008 as a UH-60 pilot, I reached the peak of my mental and emotional anguish. Up to that point, I had been certain that I would find complete healing and relief from the effects of my childhood trauma. When my healing seemed to be stuck in a holding pattern, I felt trapped in a place of torment and pain and I wasn’t sure anymore if my life would find release or end up another suicide tragedy. For most of my life I had entertained and flirted with the thoughts of suicide, but now I had reached a point of mental and emotional crisis, the worst it had ever been and I was seriously considering suicide as the means to relieve my pain. I was standing on a very thin line and I wasn’t sure how it was going to end. Numerous, pervasive negative thoughts about myself and my self-worth fueled my struggle with suicidal thoughts. I never would have believed those negative ideas about someone else, but they were deeply rooted in my being. Even though I knew they were ultimately remnant lies left in place by my abusers, I believed them just the same. For years, I tried the “mind over matter” and “push through the pain” approaches and spent countless hours and dollars in “talk therapy.” But in the end, I remained broken, frustrated and hopeless. The strategy of just getting through the painful moment because it will be better tomorrow was overshadowed with the reality that I would find myself in this painful moment again and again until the problem (my need of healing) was addressed. I wanted to let it go, but my pain and the memories of the abuse wouldn’t let go of me. No one could explain to me why I was in such pain, why it felt like I was being traumatized over and over again even though the perpetrators were long gone from my life. I felt ashamed and crushed inside from the abuse and now my healing process hinged on my ability to figure out how to let go, which only added to the shame. Every fiber in my body was telling me that suicide was my only option and it actually felt wrong to continue to breathe. If I was going to survive, there had to be a source of motivation to counter the intensity of those negative, dark thoughts and beliefs. When I look back at how I survived, three things come to mind that gave me the motivation to not give in to the suicidal thoughts. First, knowing the truth about my situation was powerful and life altering. In Aug. 2010, I met a counselor who explained to me the science behind my trauma. I learned that someone with post-traumatic stress disorder experiences that traumatic event over and over again because the trauma interrupted the transferring process of short term memories to long term memories. In long term memory, there’s a beginning and an end, but that’s not the case with short term memory which is why it felt like my abuse was happening all over again when something or someone triggered that traumatic memory. She also explained the body’s biological response to trauma and how it caused my nervous system to become “dis-regulated.” I bounced between being anxious and hyper-vigilant to crashing into extreme exhaustion and depression. And, just like telling a broken arm to heal, telling myself to “let go” of my trauma was ineffective in addressing the nervous system and traumatic memories. Thirty-two years after my abuse, I finally discovered the truth about trauma and the way forward to healing. Then I had to pursue healing relentlessly even when I doubted that it would ever come. Obviously, it took me a lot of years to finally stumble on what would facilitate my healing and address the problem that drove me to consider suicide. Today, I utilize mind-body grounding techniques called the Community Resiliency Model that focuses on sensations in order to address the nervous system’s response to triggers and stress. Physical exercise and positive resources like friends, family, music and flying also assist in grounding my mind and body. Additionally, I am undergoing a therapy called Eye Movement Desensitization and Reprocessing to process the traumatic memories and reduce their lingering influence. Talk therapy is an important element to the healing process. However, because PTSD has a biological impact, as well as producing mental and emotional effects, I needed to open myself up to additional tools and therapies for my complete healing. Utilizing healthy resources strengthened me to keep moving forward especially when the pain was at its worst. During my second deployment I had written a suicide note and planned in my mind where and how I would take my life. That was the worst time of my life and most of what I remember from it was pain. Without resources to help me, I know I wouldn’t be here today writing this. My strongest resource was my faith in God and knowing that He knew how much pain I was in and would love me through it. A close second was my mother’s constant encouragement and unconditional love for me. Having a purpose and job to do as a pilot and staff officer who didn’t want to let the team down caused me to reschedule my suicide date multiple times. I know that sounds crazy, but it’s true. My love for flying and being able to go for long runs boosted my morale countless times when I was beginning to spiral down into dark thoughts and depression. Close friends, who would never get tired of listening to me and reminding me daily that they were there, helped lighten the load. Now, when I look back at that time, I realize that all the years I invested in building and strengthening my relationships, core values, perseverance, perspective and sense of purpose, are what got me through that very dark time. One of my resilience course instructors asked this question when teaching on the spiritual domain of the Comprehensive Airman Fitness, “Are your spiritual beliefs sufficient enough to get you through a difficult situation?” Constant development and strengthening of my resilience proved to be a combat multiplier in battling the suicidal thoughts. If I had not held on, I would have missed out on the healing and every good thing in life since. I’ll never forget one of my best friends telling me that she had a nightmare during our deployment that I had actually taken my life. In her dream, she heard a gunshot and feared that it was me. When she came to my room, I was gone. Her description of that room left a powerful and significant imprint in my mind. She told me that there was no peace or release there, just sadness, emptiness and tragedy. What I really wanted was peace and release, not tragedy. Though I stood on a thin line for a long time, I am now experiencing the side of peace and release. I’m not saying that I don’t hurt anymore or that there aren’t days when it’s tough, but it’s nothing like it once was. If you’re reading this, and you’re in that place of pain and considering suicide as an option, please consider my story. It is a lie that the problem is too great to solve, that the mistake is too big to forgive, and that the wound is too much to heal. 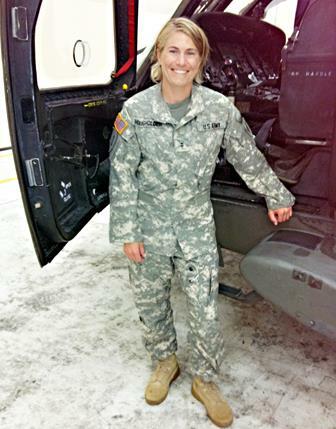 1 comment for "Thin Line: Local soldier shares her story"